Eagle-eyed viewers might have noticed that my photo of election leaflets on the previous page didn’t include a Conservative Party leaflet. Let’s remedy that, with these images of an ancient artefact excavated from the boxes in my understairs cupboard archive. 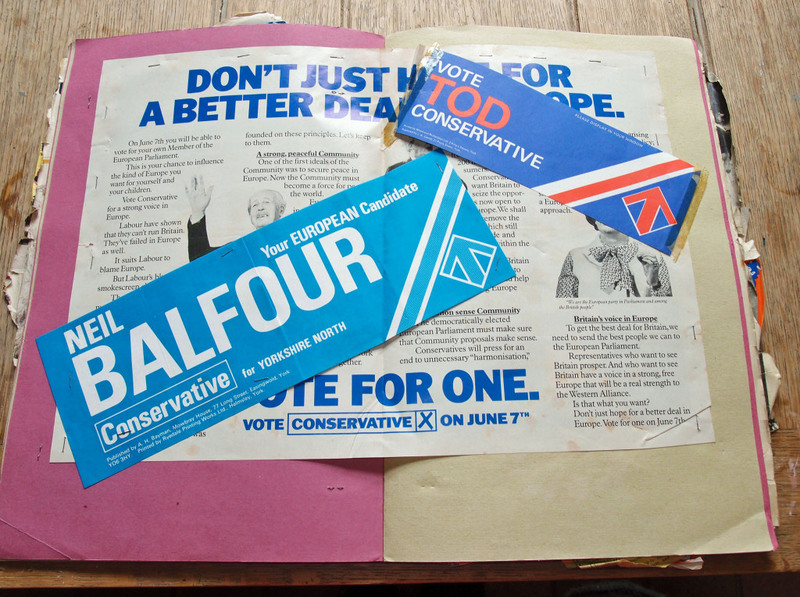 Between a page of press cuttings on the 1978 York floods and before many pages filled with magazine pictures of David Essex (swoon), this double-page spread of election leaflets graced my late 1970s scrapbook. 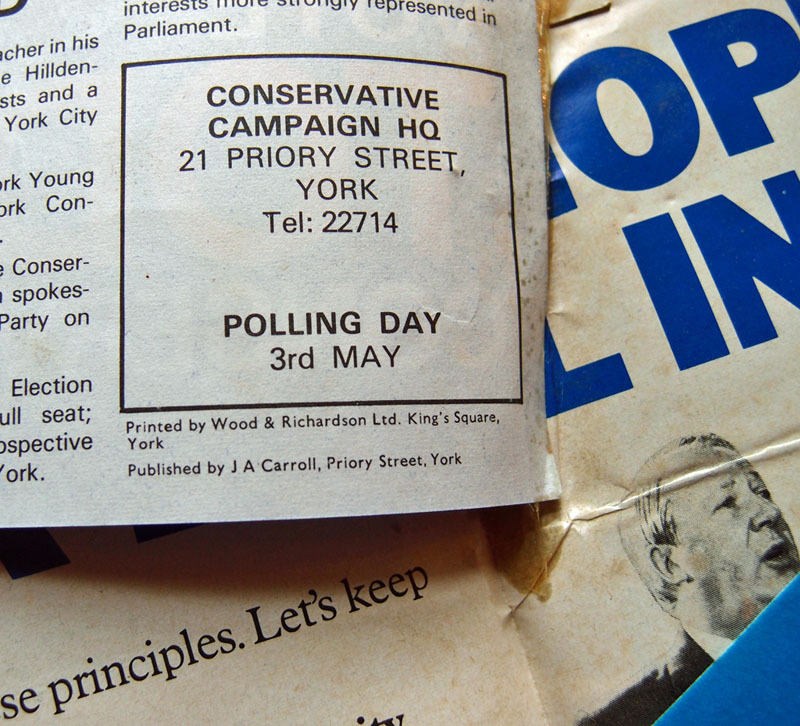 Two from the 1979 European elections and one promoting the candidate for MP for the City of York in that year’s general election. 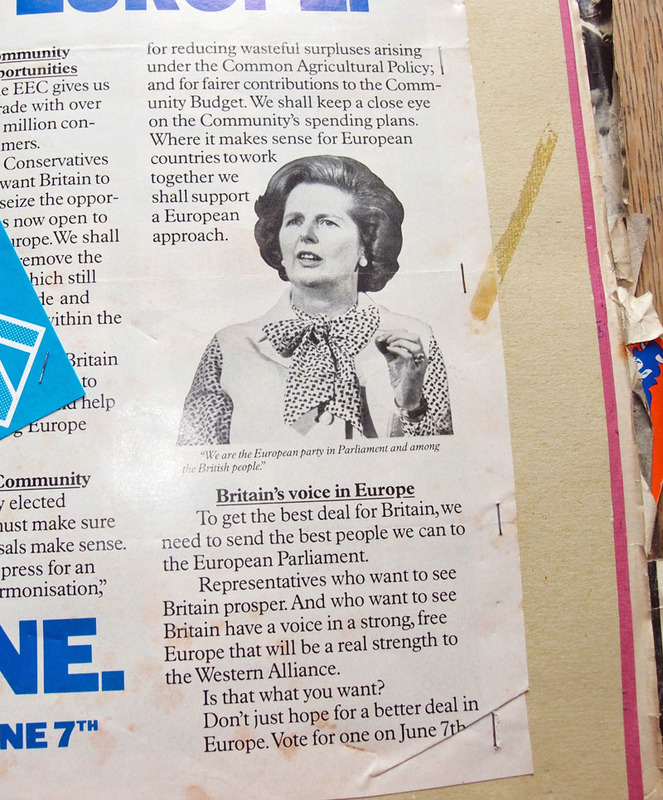 All Conservative party leaflets, because that’s what my parents voted. Presumably the Labour Party leaflets had ended up in the bin (no recycling facilities back then). I was far too young to vote, and I have no idea why I carefully stuck these into my scrapbook, but can only assume that the excitement of the elections in 1979 had somehow reached me and entered my consciousness, and that I felt it needed to be recorded as an important thing, before I got to puberty and got distracted by David Essex. These images are enlargeable should you wish to study and compare them with 2015 election leaflets. But let’s not drift off to Downing Street, let’s focus on the local, as that’s what this site is really about. 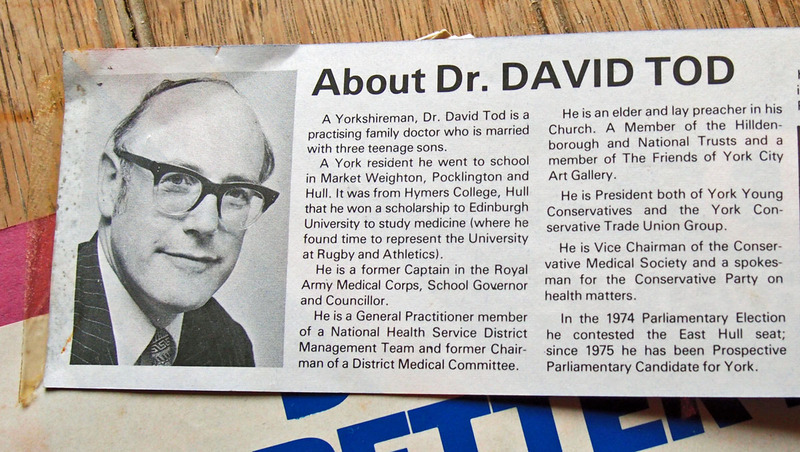 I noticed a small local detail on David Tod’s leaflet, that it was printed by Wood and Richardson, at that time based in King’s Square, apparently. Anyone remember that? Anyway, King’s Square is where we’re going next.